Rinse the mung beans and then soak them in warm water for min. 1 hr. Rinse once again and then drain the excess water from these mung beans using a sieve. In a pot, boil water over medium heat and then add mung beans. 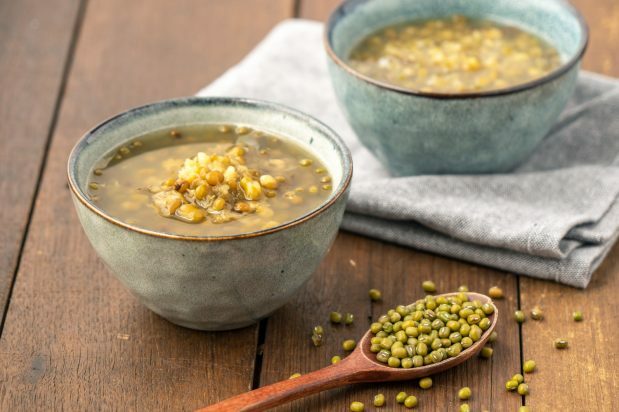 Cook until mung beans soften. Add a cup of sugar and stir. When the sugar is completely dissolved and the dessert boils again. Remove the pot from heat. Transfer the dessert to serving bowl. Serve hot or cold. If you wish to serve cold, cool and add crushed ice to the bowl.